I just did a search of my blog and was surprised to discover that I have never written anything about sweet potatoes, although we grow them every year. Sweet potatoes "like" hot weather and we have found that they do well in our Oklahoma garden. They can be grown in poor soils with little fertilizer and have few natural enemies. However, we learned very early that they have to be protected from deer because deer love them and think of them as a delicacy. The first year we grew them, we grew them outside and they produced beautiful lush vines. Then, Tom went out one morning to find all the leaves had been eaten and only nubs were left! The next year, he had the brilliant idea to plant them in our hoophouse. Since it is an enclosed structure, the deer will not go in there even though we roll up the edges and open the doors to help ventilate it. It also gets very hot in there during the summer and, while the heat does not bother the sweet potatoes, nothing else will grow in there in the summer. Here is a picture of some of the sweet potatoes we grew this past summer. Sweet potatoes are very nutritious. They are full of fiber, low in fat and have a whopping 14187 IU of Vitamin A. Sometimes sweet potatoes are called "yams", but they are not yams. Yams are primarily grown in Africa and are very different from sweet potatoes. Sweet potatoes have broad leaves and are in the same family as the morning glory. Yams on the other hand, are members of the Lily family. Also, note that sweet potatoes are not real potatoes. I used the sweet potatoes in the above picture to cook in a beef roast, along with onions, carrots and potatoes. Yes, there really is a roast under all those vegetables! I wish I knew the history of the iron pot in the above picture. I know it belonged to my grandfather, who passed it on to my mother, who passed it on to me. But, I have no idea if "Papa" bought it new or what. He was born in the late 1800s. At any rate, I love it and use it a lot. Unfortunately, the lid was lost before it came into my possession. I've searched for lids to fit it, but it is a different size than the "standard" size iron pots made today and I have not been able to find a replacement. So, I've had to make-do with a stainless steel lid from another pot. It really does not fit, but it works. Tom was a "red head" in his younger days and has always had trouble sunburning. During the summer, he wears a hat, sunscreen and long sleeved shirts to cover his arms. So, I felt it only fair that I include one about his shirts as well. Here is a picture of one of his shirts that has outlived its usefulness. This picture does not do it justice. The collar is frayed. It contains several rips and holes and it is stained. Being the frugal person that I am, I still hate to throw an item of clothing away. But, alas, it eventually has to be done. However, before I tossed the shirt in the trash, I cut the buttons off and saved them. Have you ever counted the number of buttons on a man's shirt? Well, here is a picture of the ones I cut off of this shirt. There are a couple of different sizes, but all total there are 18 buttons! I put the buttons in a large jar. Over the years, I have amassed an amazing collection of different kinds of buttons. And, whenever we have a piece of clothing that has lost a button, I can usually find a suitable replacement in my "button" jar. I have also found that the button jar serves as a source of entertainment to keep grandchildren out of trouble for a little while. Even though it is the middle of winter that does not mean we can forget about watering. We've had very little rain the past few months. Here is a drought map of Oklahoma. 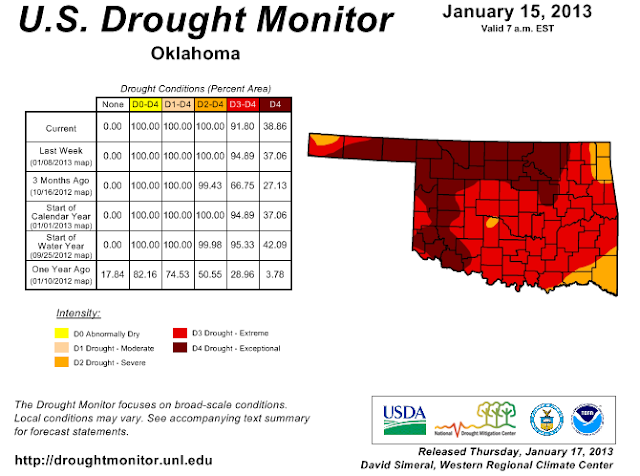 Note that Payne count is in the "exceptional" drought area. It has been pretty cold the past couple of weeks, but today has been very nice with the temperature rising to the upper 60s. So, I decided I would drag out the hoses and do some watering. I watered the blackberries that I've been struggling to keep alive the last couple of years and some of my herbs. Even though they are dormant, they still need some water in the winter. I also watered the peach trees that we set out in 2011. These poor trees have suffered through 2 hot, dry summers and are miraculously still alive in spite of my forgetting to water them or, more likely, being too much of a wimp to leave the comfort or our air-conditioned home to brave the heat to do so. They even rewarded me with 2 peaches this year as described in the following blog entry. So, it was at the urging of my guilty conscience that I made sure they got a nice drink today. I thought this picture of the sun shining on the water droplets from the sprinkler was rather pretty. You can see Tom's compost pile in the upper right background. This one is currently "in the works". On the other side of the picture (upper left), you can see a smaller compost pile through the branches of the peach tree. This one is "finished" and he has been spreading it on various garden areas and raised beds. We do not use chemical fertilizers on any of our plants, so we have to have a lot of compost! Okay, the title of this blog entry is not what you are thinking. We are not eating chicken salad for dinner. Maybe a more appropriate title would be "Salad for Chickens". During the summer, there were lots of fresh grass and weeds in the chicken pen and they sometimes just ignored any greens that we threw in there other than to inspect them for bugs and caterpillars. However, times have changed. Winter is here and the grass is dorment. We have a few greens in our hoop house. But, after we harvest enough for the market and eat some of them ourselves, there is not much left to feed the chickens. When we do have some extras, we give them to the chickens. They love them and are all over them in no time. I have some sad news to report about the chickens. We lost one this past week. We don't know what caused it to die. Tom just found it in the pen dead. It was odd because it was alive and appeared to be fine that morning when Tom let them out of the coop. This chicken was the same one that molted a couple of months ago. I recall being worried about her not having enough feathers to keep warm. However, she had grown her feathers back and apparently had been laying right up to the end because we collected 5 eggs on several days the past 2 to 3 weeks. If you recall, we started out with 6 chicks in the spring and lost one to a snake. See the following entry to read about that. So, that left us with 5 and this death leaves us with 4. That is still plenty for us to have enough eggs for ourselves and still give some away. I guess we'll eventually have to get more chickens because they are not long-lived. But, Tom and I have both gotten somewhat attached to them and enjoy them immensely. So, it is kind of sad to have one die. It is made of aluminum. The piece in the lower left position is the grounds container. Here is a better picture of it. Notice the small holes in the bottom. They are big enough to allow water to drip through, but are small enough that the grounds would stay in it and not get in the coffee. This piece fits on top of the pot itself, like this. After the coffee grounds were added, the next piece was assembled on top. This piece is the water container. Water was heated in a sauce pan and when it got to boiling, it was poured into the water container. The container has small holes in the bottom that allow the water to drip through to the coffee grounds underneath. There is also a lid that fits on top of the entire assembly. The lid also fits on the pot. So, I assume the idea was that once the coffee was finished, you could remove the top part and use the lid on top of the pot to help keep the coffee warm. I also recall they had a "perc-o-lator" at some point. It was electric and was one step up from the drip-o-lator. Apparently, the name stems from the fact that the water was put into the bottom of the pot and as the water heated to a boil, it rose through a tube and dripped or percolated over the grounds at the top. Percolators were once state of the art, but were supplanted in the early 1970s by automatic drip coffee makers. I'm not sure what happened to the percolator. Maybe it broke and was thrown away at some point. At any rate, I've never actually used this old drip-o-lator. I'd like to try it out sometime, but I usually steer clear of aluminum cookware because of concerns over its safety. I'd rather play it "safe" than be "sorry". So, for now, I'll just keep the old drip-o-lator as a memento of my childhood and display it where others can enjoy it was well. Happy 2013! The kids and grandkids left yesterday morning. So, Tom and I stayed up, watched the new year roll in last night, slept late this morning and are spending a nice quiet day here at home. It seemed like a good time to check the pictures on the wildlife camera. On it, I found the usual wildlife pictures, along with an amazing engineering feat that involved the grandkids. Here's a sequence of pictures that documents their engineering prowess. But, first, some background. I've mentioned many times how we are in the midst of a terrible drought. Most of the creeks are dry and several of the shallower ponds nearby have dried up. So, this fall we purchased a large plastic water tub to set out for the deer and other wildlife. The wildlife seem to appreciate it very much, as demonstrated below. However, during the cold weather we've recently had, the water froze. By the time the grandkids got here, it had warmed up enough that they could enjoy playing outside, but there was still a thick layer of ice on top of the water tub. This did not go unnoticed by them. It was so thick, in fact, that it would support their weight. They immediately went about trying to remove the ice. But this was going to require more than just 2 of them. Notice how the little one on the right is using all her might to push down on that end. I think at this point they realized if they could push one end deep enough into the unfrozen water at the bottom, then the other end would rise far enough out of the water that they could get under it and maybe get it out. But they needed more help. The youngest grandson was enlisted. I imagine it was his idea to use those old bricks as weights. I'm glad they used the bricks rather than one of themselves for weight. I'm sure they would have gotten in trouble with their parents had they come in with wet shoes, socks and feet! Finally, they had enough weight piled up on one end so the other end was up out of the water. But a lot of strength was needed to lift that ice up enough that they could get their hands under it. Then it was "all hands on deck" to finish the task. Finally, they were able to stand back and take pride in their accomplishment. Not sure what Grandpa is doing out there . . . pointing to something. Whatever, I know he appreciated them getting that hunk of ice out of the water tub. Otherwise, he would have had to do it himself. And, I'm sure HE would not have had nearly as much fun as they had.